A common question from many clients is: We've never done this before. What questions should we be asking? At Carefree Yacht Charters®, we're here to help! We owned and operated our own successful BVI crewed charter yacht for 12 years and are currently ranked as a top 5 BVI Yacht Charter Company. We know the ins and outs on all sides of the business and will guide you through the entire process. We'll ensure you're well informed and keep you abreast of anything you need to be thinking about for your charter. In the meantime, you can sit back, relax, and enjoy a Carefree charter experience. Call us in our South Florida office at 954-980-9281, Toll Free at 888-670-6884, or complete our Quick Request Form. We'll answer any questions you may have and start the process of matching you with a charter yacht that fits your budget, style and interests. First of all, I want to express how much I appreciate ALL you did to make our BVI vacation a trip of a lifetime. From the first phone call to the last, you were patient with all my questions and had all the answers needed to made the decision making much simpler on our end. As this was our first charter, we had no idea where to start and how to proceed. You made the process fun and exciting - most importantly...you instilled trust. Although we were just one small charter in your busy business, your personal attention and constant accessibility made us feel important and valued. I have already referred a couple friends to Carefree and we will most certainly turn to you for our next trip. 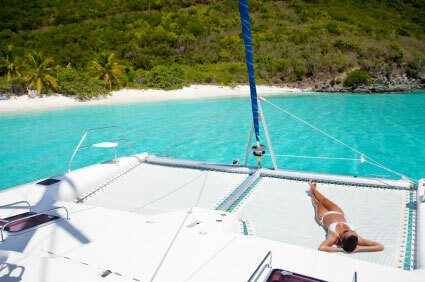 What's the cost of a 7 night charter in the BVI or other Caribbean destination? In general, the majority of our charters are all inclusive, ranging in price from $15,000 to $65,000 per week. Our other category of luxury charters start around $35,000, plus all expenses. The cost of Caribbean or BVI crewed charters will vary depending on the type of yacht you choose and the number of charter guests in your group. Learn more about our crewed yacht charter costs. What's included in these charters? The majority of our Caribbean yacht charters, including our popular BVI yacht charters, are all inclusive charters, including meals, beverages, standard bar plus use of on-board water sports equipment. Typically, the only item excluded from our all inclusive charters is the standard 15-20% crew gratuity. Our other category of luxury yacht charters includes the yacht only, with all other charter costs being additional and at the Charterer's expense. Learn more about the different pricing structures. No. Our recommended yachts set their own rates, have "published rates" within the industry, and have priced themselves competitively based on current market trends. However, several of our yachts do offer published specials throughout the year. See our current yacht specials for further information. Once I choose a yacht, what's next? Our first step is to place a complimentary hold on the yacht of your choice. At that point, you'll also receive our standard industry contract along with all the details needed in order to move forward. Why book with Carefree Yacht Charters® vs. direct with a yacht? The rate for the yacht will remain the same, but you'll gain an added level of protection and expertise at no additional cost when using our professional services. In particular, your deposit funds will be held safely in an industry escrow account for your protection, rather than immediately released to the crew or owner of the yacht. With years of experience as charter yacht brokers, we specialize in the many details required for booking and arranging successful charters while the crew specializes in conducting the actual charter. Finally, the use of our professional services will ensure that your best interests are considered and protected just in case the unexpected happens. Should I book my airfare before or after I book the charter? It's best to book airfare once we have a complimentary hold in place and you've had a chance to review the contract and other associated details that we'll send you. At that point and once you know you'll be moving forward within 48 business hours, it is safe to book your flights. What forms of payment do you accept and do they include credit cards? When should I book a holiday charter or a Spring Break Charter? Quite simply, it's never too early to book a charter, particularly a Christmas or New Years charter in the BVI. Booking your charter at least one year in advance is often necessary to secure the yacht of your choice. Our Spring Break Charters are our next most popular time frame and these should be booked up to a year in advance as well. What's the typical length of a charter? All yachts can be booked for 7 nights or longer and a majority of the yachts can be booked for 5 or 6 nights at a pro-rated rate. To determine 6 night rates, divide the weekly rate by 7 then multiply by 6. To determine 5 night rates, the industry divides the weekly rate by 6 then multiplies by 5. Please note that our minimum charter length is 6 nights. On what day and time do these charters start? Charters run from noon to noon and can be booked starting on any day of the week. The only exception is with Christmas and New Years charters, in which case the yachts do mandate particular date ranges so that they can secure a week long charter for each holiday. Where do these charters typically start? Virgin Islands charters, which include our popular BVI yacht charters, typically start in either St. Thomas in the USVI or Tortola in the BVI. Your starting point will also depend on your yacht of choice, the number of guests in your group and your flights to and from the Virgin Islands. Discover more about Getting to the USVI and BVI as well as pick-up points for these charters. St. Maarten charters typically start and end in St. Maarten, while charters in the Grenadines typically start and end in St. Vincent, Bequia or Grenada. What if we have a group of 12 or more? Many of our clients with larger groups opt for one of our tandem charters, in which two or more comparable yachts charter in tandem throughout the week. Our BVI yacht charters typically offer the best suited yacht options for this type of charter. When do we start planning our itinerary? Your crew will reach out to you directly about two weeks prior to the charter to go over final details, preference questions and at that point can discuss itinerary in general. It's best to leave final itinerary decisions until Day 1 when you're aboard your yacht and the Captain has an opportunity to assess the weather at hand for the week. View our BVI Charter Itinerary Suggestions, which will give you a good feel for what a typical BVI Itinerary might look like. How do the yachts know what kind of food & beverages to stock? Upon confirmation of a charter, you'll gain access to our online Preference Form, which we personally developed after having completed over 300 of our own crewed charters on our own charter yachts. This form makes note of your personal preferences and requirements with regards to foods, beverages, and activities on your charter. This will also allow your group to complete one online preference form from different locations. Your weekly menu will be specifically tailored around your food preferences and dietary requirements, your beverages stocked accordingly, and your itinerary planned out around your particular likes, dislikes and special requests. What should we pack on our charter? Based on our 12 years of experience aboard our own crewed charter yachts in the BVI, Carefree Yacht Charters® has created a list of packing tips for your BVI or Caribbean yacht charter. Once you book your charter with us, you'll gain access to all kinds of detailed and non-public information, such as our packing tips list. Is fishing an option on these charters? Yes! Most of our yachts offer on-board fishing. Fishing licenses are required for anyone 18 years of age or older that wants to fish while in the BVI. Learn more about BVI fishing license rules and regulations as well as why you want to obtain your fishing license in advance. One month in advance of your charter, Carefree Yacht Charters® will provide you with all the necessary details. What about scuba capabilities on these yachts? Many of our yachts have scuba capabilities with onboard Dive Masters or Dive Instructors. If you have scuba related questions or interest in Scuba diving or Scuba Instruction while on charter, we're your expert source of information. Lynne & Joe Campbell, the owners of Carefree Yacht Charters® are both PADI Dive Instructors and served as such during their 12 years aboard their own crewed charter yachts in the Caribbean. Learn more about our dive charters. What's it like on a crewed charter yacht vacation? Watch a short video featuring Soon Come, one of our popular and luxury catamarans, to catch a glimpse of what it's like on a crewed charter yacht vacation. Please note that this video features a previous crew. Do yachts have specific itineraries they follow? All of our crewed charter yachts will have a favorite and typical route that they like to follow. However, these itineraries are extremely flexible based on your activity preferences, places you specifically want to visit, plus the weather as the week progresses. Crews will make island and anchorage choices based on the interests and desires of your group. Learn about what a typical day on a crewed yacht charter might look like. If you have any other questions about crewed yacht charters, please call us in our South Florida office at 954-980-9281, Toll Free at 888-670-6884, or complete our Quick Request Form.